The ECMF incorporates the compliance policy to demonstrate the University’s leadership commitment to effective and responsive compliance management. The ECMF provide the structure, direction and oversight for the systematic, disciplined and consistent identification and management of legal and regulatory compliance obligations. Does the ECMF apply to my portfolio/entity? The ECMF is approved by the Vice-Chancellor and President, and it applies UQ wide, including controlled entities. The University’s governing bodies provide oversight functions with compliance obligation accountability assigned to Compliance Owners for the compliance categories. Roles within the University recognised as having compliance responsibilities and performing compliance activities are known as Compliance Administrators. Who is responsible for implementing effective compliance management? Leaders at all levels are responsible for ensuring compliance with legal and regulatory obligations. All staff are responsible for complying with the University’s Code of Conduct and students with the Student Integrity and Misconduct Policy. Operational controls are the key requirements of the ECMF which facilitate effective and efficient compliance management. These include the compliance register, local management procedures, training and the management of compliance issues and breaches. Monitoring and review of compliance processes and performance includes the assessment of activities through the Compliance Assurance Program (CAP). Compliance recording and reporting provides for an end-to-end view of the compliance environment to ensure continual improvement or escalation, if required. 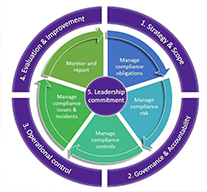 For more information, please view the Enterprise Compliance Management Framework (pdf).